Thursday, Feb. 15, 2018, 5:30 – 6:30 p.m. The criminalization of Black life has continued to accelerate, even while activists and artists fight the ongoing expansion of the prison industrial complex. In August 2018, the Contemporary Arts Museum Houston will feature artists who have worked to resist the various elements of the prison industrial complex in the exhibition “Walls Turned Sideways: Artists Confront the American Justice System.” This talk by Sampada Aranke focuses on two of these elements: criminalization and surveillance. While these elements of state control rely primarily on sight, Aranke focuses on how Black contemporary artists attempt to escape these modes of control by re-centering the bodily and sensorial. Deploying aesthetic strategies like saturating the plane in deep, layered black hues from which images are hard to see, or blurring drawn lines to trick modes of optical perception, these artists turn to elements of sensorial as a way to approach the fugitive qualities of Blackness and the reach towards freedom. 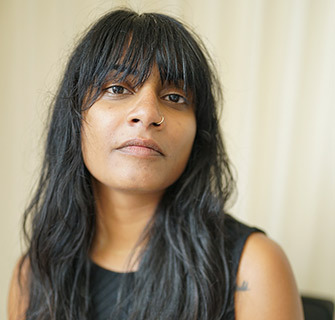 Sampada Aranke (PhD, Performance Studies) is an Assistant Professor in the Art History, Theory, and Criticism Department at The School of the Art Institute of Chicago. Her research interests include performance theories of embodiment, visual culture, and black cultural and aesthetic theory. Her work has been published in e-flux, Artforum, Art Journal, Equid Novi: African Journalism Studies, and Trans-Scripts: An Interdisciplinary Online Journal in the Humanities and Social Sciences. She has written catalogue essays for Sadie Barnette, Kambui Olujimi, and Zachary Fabri. She's currently working on a book manuscript entitled Death's Futurity: The Visual Culture of Death in Black Radical Politics. Aranke’s talk is hosted by The Black Embodiments Studio, a writing incubator and public lecture series that examines how definitions of blackness are produced and expressed through visual, aural, and affective realms.